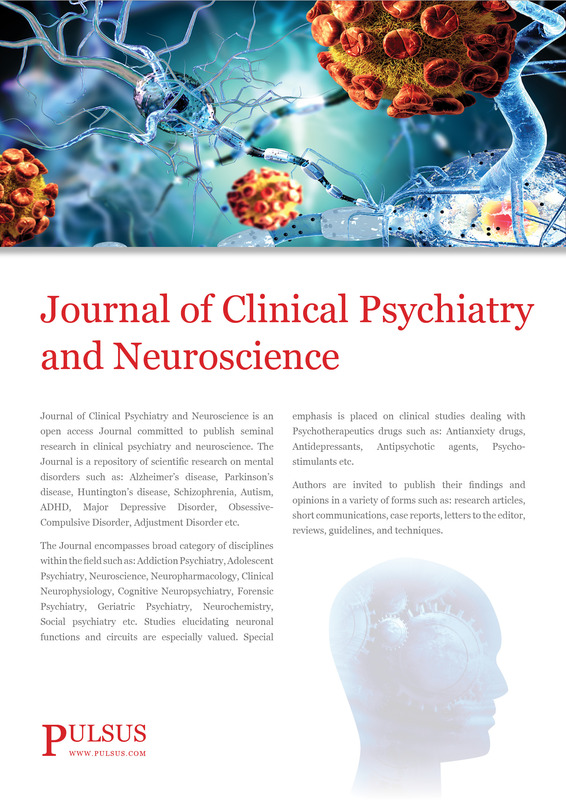 Journal of Clinical Psychiatry and Neuroscience is an open access Journal committed to publish seminal research in clinical psychiatry and neuroscience. The Journal is a repository of scientific research on mental disorders such as: Alzheimer’s disease, Parkinson’s disease, Huntington’s disease, Schizophrenia, Autism, ADHD, Major Depressive Disorder, Obsessive-Compulsive Disorder, Adjustment Disorder etc. The Journal encompasses broad category of disciplines within the field such as: Addiction Psychiatry, Adolescent Psychiatry, Neuroscience, Neuropharmacology, Clinical Neurophysiology, Cognitive Neuropsychiatry, Forensic Psychiatry, Geriatric Psychiatry, Neurochemistry, Social psychiatry, Neuropathology etc. Studies elucidating neuronal functions and circuits are especially valued. Special emphasis is placed on clinical studies dealing with Psychotherapeutics drugs such as: Antianxiety drugs, Antidepressants, Antipsychotic agents, Psycho-stimulants etc. Authors are invited to publish their findings and opinions in a variety of forms such as: research articles, short communications, case reports, letters to the editor, reviews, guidelines, and techniques.